Perhaps nothing signals the return of kids to school like the backpack. I don't ever recall carrying a backpack, loaded with books, to and from my own school as a kid. But since the day my oldest was born, I've been scouting the perfect back-to-school backpack. Where did this obsession with backpacks come from? I can't recall anyone carrying a backpack when I was in school (ok - it was the 70's and 80's). According to this fantastic article by Lee Hale from NPR, the backpack craze as we know it launched itself firmly in 1982, when LL Bean featured their Book Pack. It quickly became the company's top-selling product, and is still one of the top sellers in backpacks today. By the late 1980's every kid was carrying a backpack. So when my little soon-to-be kindergartner was ready, a shiny new backpack was a back-to-school shopping must. He picked out a grey puzzle piece/camo backpack from Lands End. At the time, Lands End had just started making different sized backpacks and this model came in a "Little Kid" version, perfect for his kindergarten size. By the way, when it comes to backpacks, size really does matter. Almost every child health site has a section on backpack weight safety. When worn correctly, the weight of a backpack is even distributed across the body, making shoulder and neck injuries less common, than if they were carrying a messenger bag or a purse. 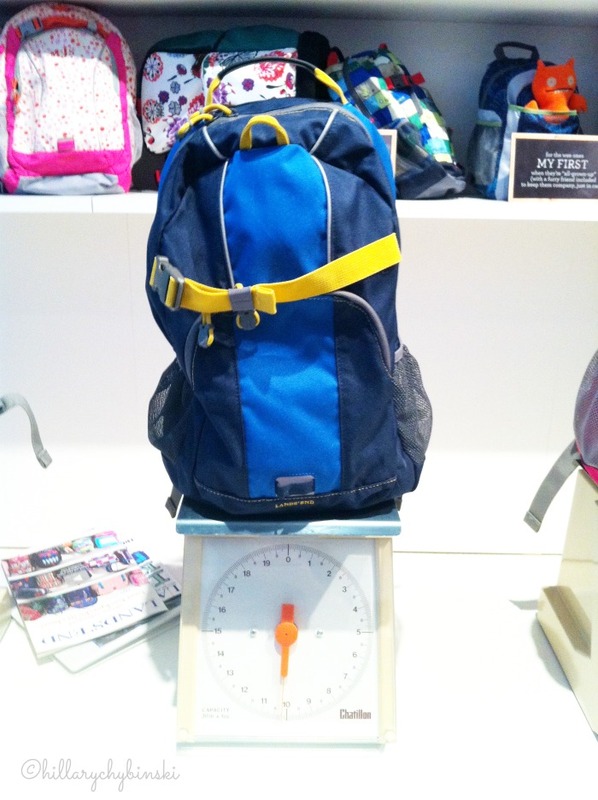 Lands End allows parents to search backpacks by child height and/or age, ensuring a proper fit. Experts suggest that kids carry no more than 10%-15% of their body weight in their backpacks. This has always been a challenge for my skinny kids. Heavy and over-loaded backpacks can cause a lot of problems. Not only are they bad for the body health of the child carrying it, they tend to stick out further and other kids can get "hit" as the wearer moves around. Heavy packs can fall off a shelf onto an unsuspecting child (or adult - ouch). Kids can even trip or fall over the large packs, as they are often placed int he aisles of the bus, or classroom. 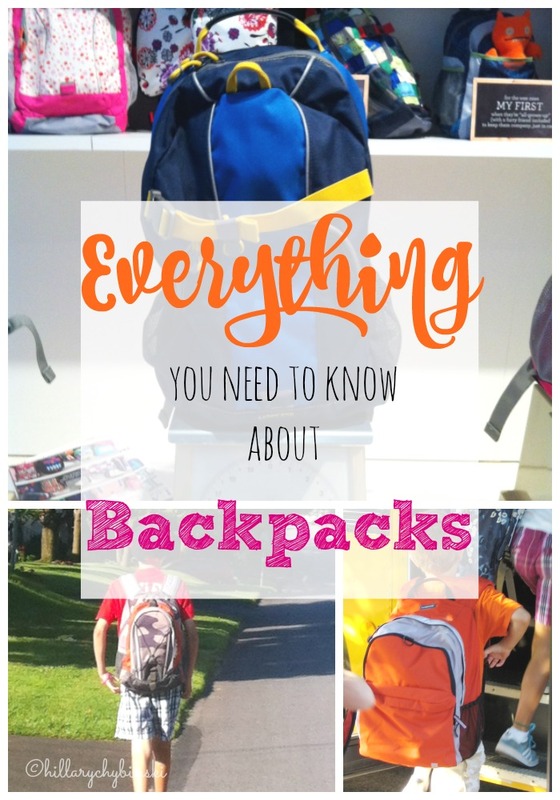 So while picking out a fun color, character or pattern is at the top of every kid's list, as parents, we have a lot to consider before we say, "ok" to a backpack. There are backpacks available just about everywhere and at every price point. In my eleven years of back-to-school shopping, I have learned that if I pay a little more in August for a backpack - we are still using that same one all summer too. Quality counts when something gets that much use (and abuse) day in and day out. We have always been Lands End and LL Bean fans when it comes to backpacks. When you're shopping for a backpack, it is also important to keep in mind what your child is actually going to be putting IN the backpack. Will they carry a Chromebook or other device? Then a protective sleeve is must-have. A folder, some art supplies and their lunch? Then a smaller bag will do just fine. Water bottle? Check for outside water bottle pockets, straps or holders. Whatever they are carrying, get in the habit (and get your child in the habit) of cleaning out the bag regularly. Those stories of forgotten granola bars and lost homework? ALL TRUE. As part of our "coming home" routine, the kids empty their backpacks every afternoon: removing (and throwing away) any trash, putting important papers on mom's desk, and taking out homework. I didn't trust hooks in the wall to hang our backpacks like you see in all those pretty Family Command Centers on Pinterest, so I bought a big basket at Home Goods and the backpacks go in there after they are emptied. When they re-pack them before bed, they get returned to the basket for easy retrieval in the morning. What pack are your kids carrying this school year? Our Land's End backpacks have survived really well, especially when my kids were younger. They were great. We have been buying lands end for years, we haven't had to buy a new one in 3 years.